Selenium is a collection of drivers which can steer a wide range of browsers like Firefox, Chrome, Safari, Internet Explorer, and Edge, in addition to emulators. It’s all the rage with developers for non-regression testing of the user interface. Selenium is driven by a programming language (Java, Python, PHP…) which then provides for running commands on web browsers. The driver is directly integrated into the script in Java, Perl, C++, Ruby, or other languages, and the calls to Selenium functions are made entirely within the scripting language. 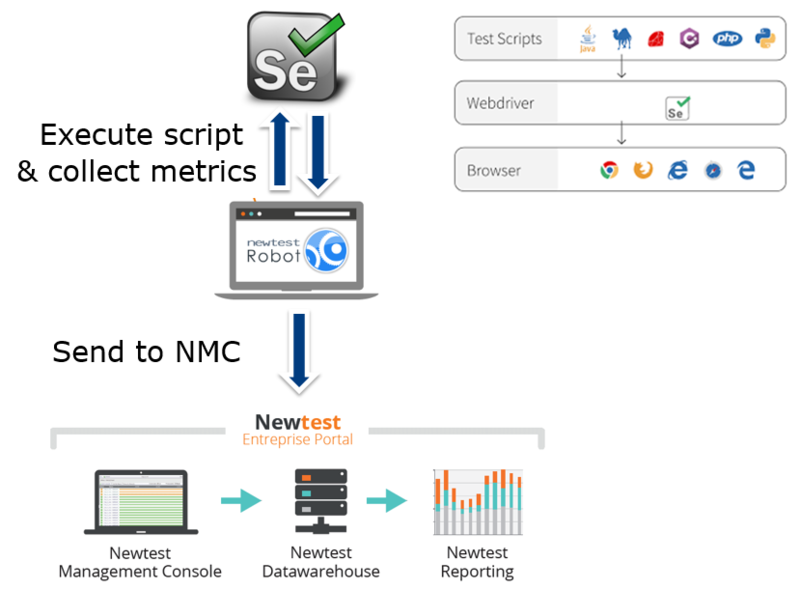 One reason to integrate Selenium with Newtest is to automate the administrative task of updating of user experience monitoring in production. To do this, Newtest runs the Java script, for instance, and retrieves the ensuing results and response times to propagate to NMC (Newtest Management Console). Next, the results of the execution are integrated in the standard way, with Newtest alerting. An advantage of implementing Selenium with Newtest is that scripts from R&D can be reused, consequently saving time on scripting. Another major advantage is that it pushes automation up a notch, in particular between R&D and Operations. Unlike NewtRIA, which is intended for production operators, Selenium is designed for web developers. First of all, you need to set up the Selenium development environment and libraries on the Newtest robot. Next, add the Selenium scripts in the programming language to the Newtest robot, with a specified path (configured as an .ini parameter in order to be configurable in a deployment tool). Afterwards, ProgramExec can be used to run the Java/Python scripts in a command interface, for instance. 1. Measurements can be conducted in Selenium using system timings and then be retrieved to Newtest using LogTpsFromArg, which reads variables in a console and propagates them as measurements to Newtest. 2. Or you can conduct measurements with the timers in Newtest, and use the standard outputs provided for in the script. Find the full webinar on the subject by clicking here.